The Simple English Wiktionary has a definition for: Japan. 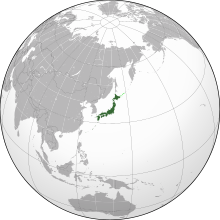 Japan (Japanese: 日本) is a country in East Asia. It is a group of many islands close to the east coast of Korea, China and Russia. The Pacific Ocean is to the east of Japan and the Sea of Japan is to the west. Most people in Japan live on one of four of the islands. The biggest of these islands, Honshu, has the most people. Honshu is the 7th largest island in the world. 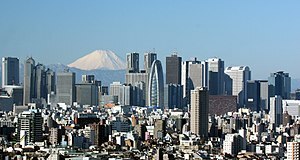 Tokyo is the capital of Japan and its biggest city. The earliest records on Japan are from Chinese documents. One of those records said there were many small countries (in Japan) which had wars between them and later a country, ruled by a queen, became the strongest, unified others, and brought peace. The Japanese began to write their own history after the 5th and 6th centuries, when people from Korea and China taught Japan about the Chinese writing system. Japan's neighbours also taught them Buddhism. The Japanese changed Buddhism in many ways. For example, Japanese Buddhists used ideas such as Zen more than other Buddhists. In the ancient and Middle Ages, China gave Japan many new cultural ideas, but their friendship became weaker later. In the late 13th century, Mongolians from China tried to invade Japan twice, but they could not. The samurai and shogun of Medieval Japan are similar to knights and lords in Medieval Europe. Japan had some contact with the Europeans in the 16th century. The Portuguese were the first Europeans to visit Japan. Later, the Spanish, English and Dutch came to Japan to trade. Also, they brought Christianity. Japan's leaders welcomed them at first, but because Europeans had conquered many places in the world, the Japanese were scared they would conquer Japan too. So the Japanese did not let the Europeans come into Japan anymore, except in a small area in Nagasaki city. Many Christians were killed. Only the Chinese, Korean and Dutch people were allowed to visit Japan, in the end, and they were under careful control of the Japanese government. Japan was opened for visitors again in 1854 by Commodore Matthew Perry, when the Americans wanted to use Japanese ports for American whale boats. Perry brought steamships with guns, which scared the Japanese into making an agreement with him. This new contact with Europeans and Americans changed the Japanese culture. The Meiji Restoration of 1868 stopped some old ways and added many new ones. The Empire of Japan was created, and it became a very powerful nation and tried to invade the countries next to it. It invaded and annexed Ryukyu Kingdom, Taiwan, and Korea. It had wars with China and Russia: the First Sino-Japanese War, the Boxer Rebellion, the Russo-Japanese War, and the Second Sino-Japanese War, which grew to become a part of World War II when Japan became allies with Nazi Germany and Fascist Italy. In 1941, Japan attacked Pearl Harbor in Hawaii, a water base of the United States, and destroyed or damaged many ships and airplanes. This started the United States' involvement in World War II. American and Japanese forces fought each other in the Pacific. Once airbases were established within range of the Japanese mainland, America began to win, and started dropping bombs on Japanese cities. America was able to bomb most of the important cities and quickly brought Japan close to defeat. To make Japan surrender, the United States dropped two atomic bombs on the cities of Hiroshima and Nagasaki, killing 150,000 Japanese citizens. Soon after this the Soviet Union began to fight against Japan, and the Japanese army in Manchuria lost. Japan surrendered and gave up all the places it took from other countries, accepting the Potsdam Proclamation. The United States occupied Japan and forced it to write a new constitution, in which it promised to never go to war again. Japan is a group of islands in the Western Pacific, off the coast of China. The four biggest islands are Honshu, Hokkaido, Shikoku, and Kyushu, and there are about 6,000 smaller islands there. Japan is separated from the Asian continent by the Sea of Japan and the East China Sea. Honshu, which means 'Mainland' in the Japanese language, is the biggest island. Hokkaido is the island north of Honshu. Kyushu is the island west of Honshu. Shikoku is the island to the south-west of Honshu. In the middle of Japan there are mountains. They cover the middle of the islands and leave a very narrow strip of flat land on most coasts. Many of the mountains are extinct volcanoes, but some are still active. The highest of these mountains is the beautiful, volcano-shaped Mt Fuji (3,776 metres or 12,389 feet high). Japan has many earthquakes, in fact there are about 1500 of these every year. The most recent big earthquake was in 2011 - called '2011 Tohoku Earthquake'. It caused great damage to several power plants forcing Japan to shut down all its nuclear plants. There was nuclear core meltdown which caused a serious health risk to nearby villages and cities. 90% of the people living in Japan live in just 10% of the land, near the coast. The other 10% of the people in Japan live away from the coast. Over 10 cities have more than a million people in them. The biggest city in Japan is Tokyo, which is the capital. The ruling party is the Liberal Democratic Party (Japan) and prime minister is Shinzo Abe. The legislature of Japan is called the National Diet. In the past, the Japanese learned science by way of China or from Europe in the Meiji Era. However, in recent decades Japan has been a leading innovator in several fields, including chemical engineering, nanotechnology, and robotics. There are many technological companies in Japan, and these companies make products for export. The robot Asimo was made and introduced in 2000. It was manufactured by Honda. Many things in Japanese culture originated in China, like Go and bonsai. Japan's traditional food is seafood, rice, miso soup, and vegetables. Noodles and tofu are also common. Sushi, a Japanese food made of cooked rice with vinegar with other ingredients such as raw fish, is popular around the world. The religion in Japan is mostly Shinto and Buddhist. Due to the tolerant nature of the two main Japanese religions, and the resulting intermixing of the two, many Japanese identify as both Shinto and Buddhist at the same time. There are small numbers of Christians and Muslims, and a few Jews. When it comes to popular culture, Japan is famous for making video games. Many of the biggest companies that make games, like Nintendo, Namco, and Sega, are Japanese. Other well-known parts of Japanese arts are comics, called manga, and digital animation, or anime. Many people get to know Japanese or how life in Japan is like by reading manga or watching anime on television. Since Japan is an island nation, Japan has several problems over territory because maritime boundaries can be hard to protect. These days, Japan is competing for at least 4 different territories. It cannot agree with some neighbouring countries on whether the land belongs to Japan or the other country. There are several important international airports in Japan. Narita is the major international airport in the Tokyo area. Kansai International Airport serves as the main airport for Osaka, Kobe, and Kyoto. Chūbu Centrair International Airport near Nagoya is the newest of the three. Haneda Airport is close to central Tokyo and is the largest domestic airport in the country. The Shinkansen is one of the fastest trains in the world and connects cities in Honshu and Kyushu. Networks of public and private railways are almost all over the country. People mostly travel between cities in buses. Modern Japan is divided into 47 prefectures. Before the Meiji period (1868-1912), the nation was divided into provinces which were consolidated in the prefectural system. Sumo fighters give a circle around the referee in the opening ceremony. Japan has many traditional sports such as sumo, judo, karate, kyudo, aikido, iaido and kendo. Also, there are sports which were imported from the West such as baseball, soccer, rugby, golf and skiing. Japan has taken part in the Olympic Games since 1912. It hosted the Olympic Games in 1964, 1972 and 1998. From 1912 until now, Japanese sportspeople have won 398 medals in total. Professional sports are also popular and many sports such as baseball (see Pacific League and Central League), soccer (see List of Japanese football teams), sumo, American football, basketball and volleyball, are played professionally. ↑ "National Flag and National Anthem". Retrieved January 29, 2017. The Rising Sun Flag and "Kimi Ga Yo" are respectively the national flag and anthem of Japan. This was formalized in 1999 with the Law Regarding the National Flag and National Anthem. ↑ 5.0 5.1 法制執務コラム集「法律と国語・日本語」 (in Japanese). Legislative Bureau of the House of Councillors. Retrieved January 19, 2009. ↑ "Japan Languages". Retrieved January 29, 2017. ↑ "CIA Factbook: Japan". Cia.gov. Retrieved November 9, 2011. ↑ Dentsu Communication Institute, Japan Research Center: Sixty Countries' Values Databook (世界60カ国価値観データブック) (2000). ↑ "最新結果一覧　政府統計の総合窓口　GL08020101". Statistics Bureau of Japan. Retrieved April 27, 2016. ↑ 12.0 12.1 12.2 12.3 "World Economic Outlook Database, April 2017 – Report for Selected Countries and Subjects". International Monetary Fund (IMF). Retrieved April 21, 2016. ↑ 15.0 15.1 15.2 15.3 15.4 15.5 "Japan". CIA World Factbook. CIA. Retrieved 2016-06-19. ↑ 16.0 16.1 "Early Japan (until 710)". japan-guide.com. Retrieved 2009-06-16. ↑ "Perry & Opening of Japan". history.navy.mil. 2009. Retrieved December 1, 2011. ↑ Louis-Frédéric (2005). Japan Encyclopedia. Harvard University Press. p. 242. ISBN 978-0-674-01753-5. ↑ Louis-Frédéric (2005). Japan Encyclopedia. Harvard University Press. pp. 905–907. ISBN 978-0-674-01753-5. Ministry of Foreign Affairs, papers on Japan's foreign policy, education programs, culture and life. This page was last changed on 28 March 2019, at 04:05.